Eduardo Rodriguez made a rather emphatic statement about his postseason status with a dominant performance as the Red Sox beat the Reds 5-0 Saturday afternoon at Great American Ball Park. With the victory, Boston's Magic Number to clinch the American League East was reduced to five. 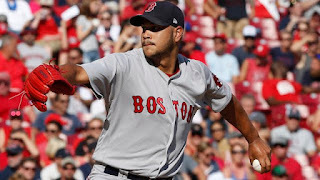 ERod (pictured) held the Reds to just three hits over 7.2 innings while striking out six. He evened his record at 6-6 as his ERA dropped to 3.91. The Red Sox scored in the top of the first on a Brock Holt sacrifice fly to take a 1-0 lead. They added to that with a three-run home run off the bat of Mitch Moreland in the top of the sixth. Andrew Benintendi finished the scoring with an RBI single in the seventh. Red Sox manager John Farrell enjoyed a special moment in the ninth inning when his son Luke Farrell came on to pitch for the Reds. It was the first time an MLB player faced his manager-father's team since 2004 when Moises Alou played against his father Felipe Alou's team.